According to governmental regulators, tax return preparation problems are more likely to occur among small mom-and-pop tax return firms. 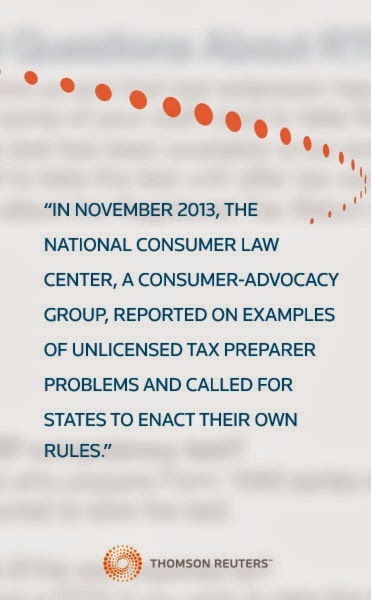 In November 2013, The National Consumer Law Center, a consumer-advocacy group, reported on examples of unlicensed tax preparer problems and called for states to enact their own rules. The Internal Revenue Service’s attempt to regulate these unlicensed tax preparers was blocked by a law suit filed by a libertarian group opposing the federal regulations. (RTRP Rules Challenged) The Obama administration has appealed the ruling and a decision is expected in the near future. In addition, legislation has been introduced in Congress that would give the IRS the authority to impose regulations on unlicensed tax return preparers. New York is now the fourth state to pass regulations governing unlicensed tax return preparers, joining the states of California, Oregon, and Maryland. New York will require independent preparers to pass a competency test and take continuing education classes before being allowed to prepare income tax returns for the public. Among the new rules, New York preparers cannot charge “an unconscionable fee” and must adhere to “best practices” according to the New York Department of Taxation and Finance site. The state’s new rules became effective December 11, 2013 and carry possible criminal penalties. New York taxpayers will eventually be able to look up tax preparers on the department’s web site to see if they are complying with the rules. A spokesperson for the department indicates that they will be investigating complaints, assessing penalties and seeking criminal prosecution. What do you think? Should the states or the federal government be the authority to regulate unlicensed tax preparers?